This is the basic cover art i created for the deus sceptrum ‘sojourn of faith’ album, which will be available soon. Target of this commission was it to create a kind of emotional lonely feeling even in a city where you’re probably surrounded by living things. Dark and depressing. 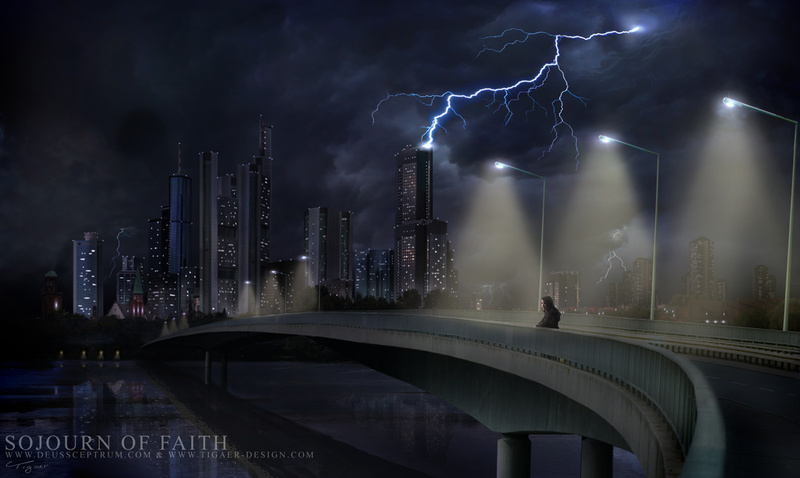 Main character in this scene is the bridge that builds the key between our lonely person and the city. I guess we would love to know what the person is thinking. Even i don’t know. Technically it’s photoshop all the way through. Photo plates, painting and manipulation. Big thanks to Julia for playing the model ;p and to Nuremberg and Frankfurt. Awesome cities. Also thanks to Daniel from Deus Sceptrum. This entry was posted on Saturday, April 12th, 2008 at 11:02	and is filed under Paintings. You can follow any responses to this entry through the RSS 2.0 feed. You can leave a response, or trackback from your own site. I use this image as the background of my Desktop. For some reason I really liked it and I think it tells a lot. Anyways, I tried to check out the Deus Sceptrum music (not the kind of music I dig honestly) but I think they don’t exist no more. Oh well. As far as your art goes Tigaer, keep up the good work, very impressive job.